Fall TACA, here I come! I found out today that I made it into the Fall TACA fair, my first time entering! Yaay! I'm planning to have lots of scarves and hats, in addition to my bowls, wall hangings, and handbags, and there may be a few surprises thrown it with new things I've been playing with. I got lots of inspiration when I was out in Oregon visiting my family in July! Fall TACA is September 28, 29, and 30 in Centennial Park in Nashville, TN! 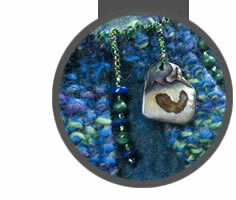 For more information, TACA's website is www.tennesseecrafts.org. I promised my mom I would take her to Fall TACA, so hopefully I will finally get to meet you in person. By the way, I have added a screenshot and link to your website on the portfolio page of Moondog Web Design. Copyright ©2007 Laura McWhorter. All Rights Reserved.